Kids crafts are so much fun to do, and getting art work home from school is especially great at this time of year. Delicately cut snowflakes, snowmen made of cotton balls, and sparkle embellished stockings to hang on your fridge. For kids not yet in school, their "talents" are still limited, but their lack of skill allows mommy to be more involved in the process. 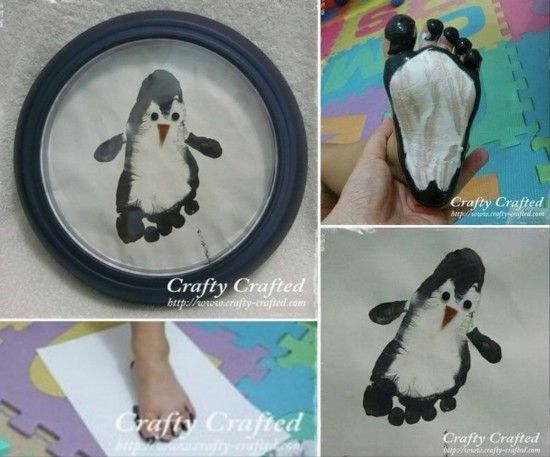 You've no doubt seen some amazing ideas for hand and footprint art on social media and wonder how to create it yourself. Count on us for tips on the right supplies, and the right techniques, to pull off one of those adorable gems for yourself! 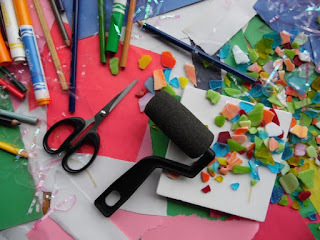 To begin any craft, especially if your baby is mobile, start with a "destruction zone" - an area that is prepared for the havoc of paint and mess. I suggest an old tarp or bed sheet for the floor under your table and a disposable table cloth from the dollar store or some old newspaper to cover the surface. Make sure you've set up all the craft supplies, gone to the bathroom, have baby wipes ready, and have filled a sippy cup to minimize distractions from the task at hand. Your child might be in to this, but be prepared for an unhappy customer and get your ducks in a row. Supplies for these crafts vary from minimal to elaborate lists, so have a good read through what's involved before you get your heart set. You will most likely need water-based paint such as Crayola Washable Finger Paint. The texture is creamy for easy application, and it wipes off clean with minimal effort. From hands and feet that is - don't dress in your Sunday best while you're creating. Having a sponge or some small craft brushes for decorations are helpful and possibly markers for final details, names, and dates. Finally, a cute surface to stamp such as card stock, paper plates, gift bags, or unglazed pottery. This is a version of my son's first footprint craft! Once you're ready for the craft, you might want to have a "ring buddy" handy. You know, the kind you tap in to grab a cloth, untangle the tight grasp on your hair, or salvage the print before baby examines it too closely. Older siblings might have fun in this role, especially if you let them have a hand in the creative process. If you're a mom to one, or the others are busy with their own activities, invite another mom to do the craft with you! 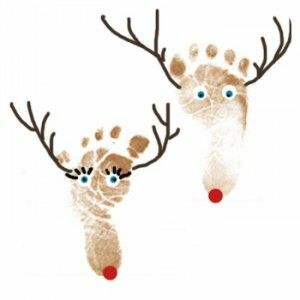 We gathered about 6 together last year to take turns making either reindeer or mistle-toes. Remember to leave plenty of time for items to dry in a safe place. Certain areas will be thicker with paint than others, so it could take hours to be ready to frame, bake, or mail to granny! With the mail being especially bogged down at this time of year, if you intend to send your gift, you should probably try sooner rather than later! Besides, you'll want time to take pictures... and decide if your creation is too cute to part with! Perfect to hang in your window or decorate your office space. 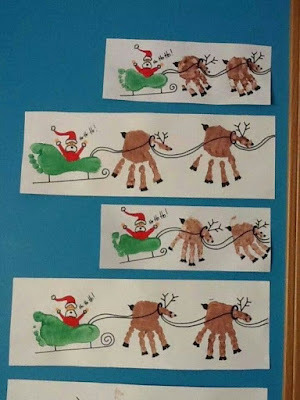 Who wouldn't want a little sleigh! This is definitely advanced level stuff though. I don't think I could free-hand a Santa like that! Thewhoot.com has a whole page of everything from clay ornaments to ribbon enhanced canvasses. If only I had more time! Good for the whole season through, why not try these fantastic penguins! The paint work is a little harder, so it might call for a more patient (read: immobile) baby, but the details from mom are that much easier! You could really do a lot with the background by layering some white and light blue card. Check out the tutorial at Crafty-Crafted. This last one is probably my favourite. You can take it in so many directions, and really make a special family keepsake. Older children can pick the colours they gravitate to, or keep it simple with 3 seasonal picks (red, white, and green / white, grey, and blue). You could even make a family strand with each member using their favourite colour or birthstone colour! The supplies are minimal, and you can read all the steps at Beneath the Rowan Tree. 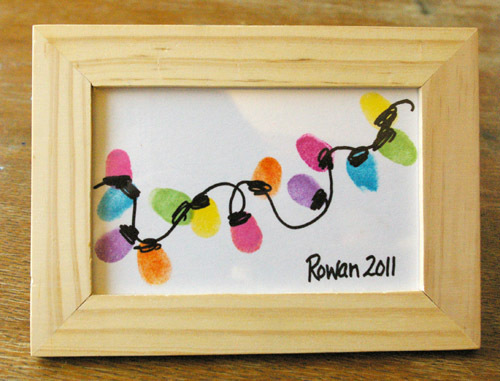 Have you had made some amazing holiday artwork? We want to see it!